"Dear Folks-I just wanted to let you know how much we enjoyed the concert at The Troubadour on Saturday, and how much we're enjoying listening to the two CDs we bought ('As The Universe Unfolds' & 'You Can't Go Home Again'). Your songwriting and musicianship are really quite wonderful." "Buzz around the ACMA was that the Jennings and Keller concert was quite possibly the best ever! After six years of concerts, that is saying something!" 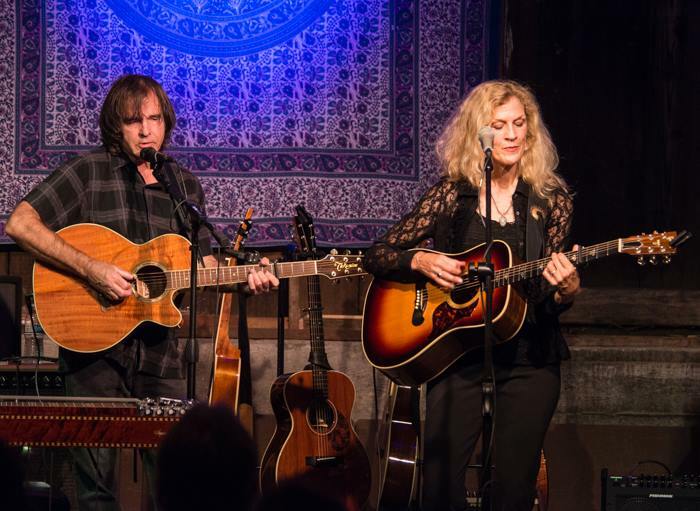 "Laurie & Dana played at the Lighthouse Café last month, and Dana brought his pedal steel - don't think "Country", rather an ethereal atmosphere; sound and waves of emotion that carry you to the outer reaches of each note and every place in between. What I mean is; it's good - reeeeel good! And Laurie sounds better than ever, which is hard to do .. You'll love it all." "Thank you artful road warriors, for the fine Corvallis concert last night! Sure appreciated the fine songs, and the clean weave of musical stories, revelations and artful groove. Loved the harmonies, articulate use of tunings, technique and lyrical explorations and play. Dana's playing was extraordinary." 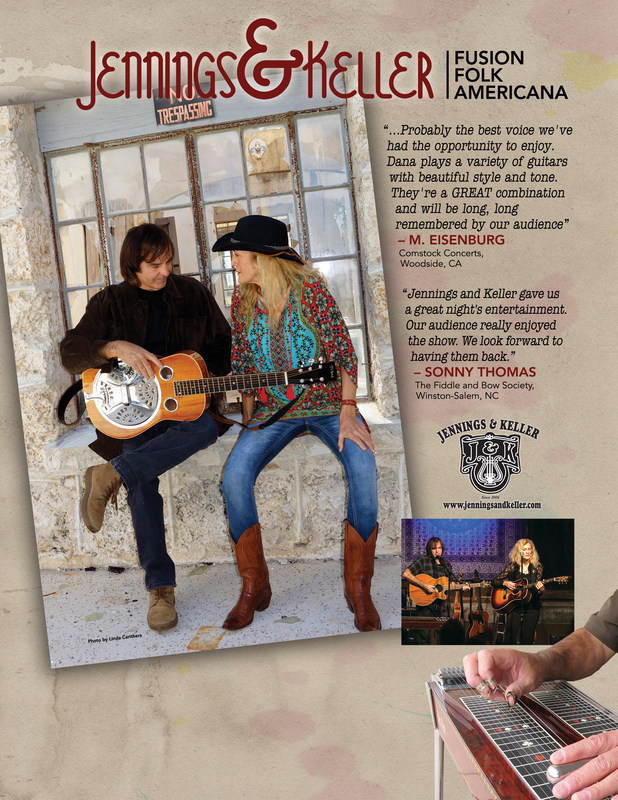 "Jennings and Keller just played my friend's Harmony House Concert series in Las Cruces, NM this past weekend and put on a wonderful show. 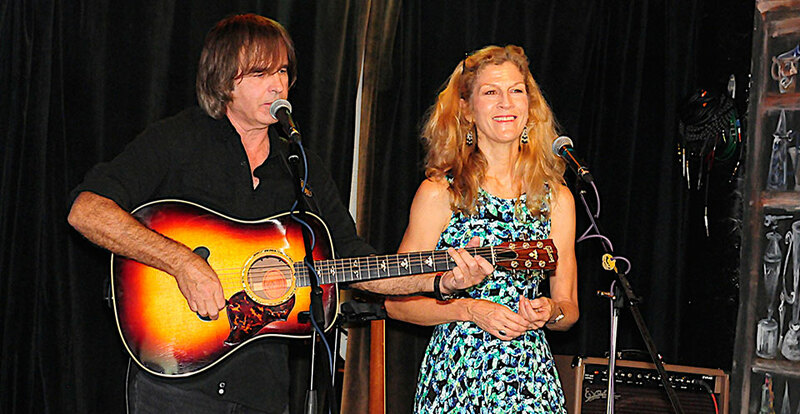 This duo from Florida plays and sings original songs of life, love and everything else. Laurie Jennings has a beautiful voice and plays a sweet guitar. Dana Keller plays outstanding dobro and sings very well. They put on a great show - great music and great sense of humor and interaction with the audience. I recommend them highly so please attend a show near you and/or pass the word to your friends. I just wanted to share the news. Their websites are listed at the bottom of the email so you can check out their music. " Vocalist Laurie Jennings Oudin’s warmth and veteran country sideman Dana Keller’s exceptionally good work on electric guitars and Dobro are the primary virtues of this unabashedly heartfelt offering. For every relatable phrase and honestly inspiring song (“Your Heart Holds the Truth,” “My Baby Wants to Be a Bell Ringer”), another lyric comes weighted with precious images of shamans, Avalon and ancient stars (e.g., “I was raised from the ashes of an obsolete and cluttered ego”), though baby boomers of a certain age may be drawn to this Florida duo’s thoughtful folk. At Coffee Gallery Backstage tonight. jenningsandkeller.com. Laurie Jennings Oudin knows a thing or two about the relationship between musicians and coffee shops. Ms. Jennings managed and booked music for a café in Florida for several years before becoming a full-time musician herself. She will be performing with Dana Keller at the Acoustic Seen at Coffee Underground in Greenville on Friday evening. "...a delightful night of songs from the soul. Your music is fresh and we all felt we were a part of your life journey .... that's a great gift. Thank you for sharing your gifts with us." "They put on a tremendous show! Laurie seemed to draw from just about every genre of music - each song was wonderful! Between Laurie's beautiful voice (and presence) and Dana's VERY talented dobro accompaniment it was an hour (plus) of sheer joy!" 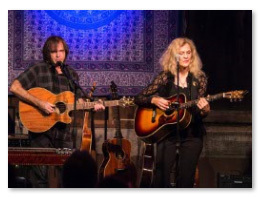 "...we enjoyed two great sets of original music (three of Dana's own compositions), and a few special covers as well (Dana's dobro solo on While My Guitar Gently Weeps is jaw-droppingly good) - I of course adore Susan's House and, much as I believe Hold Fast the Wheel will always be my favorite of Laurie's self-penned tunes, it was a delight to hear some brand new ones: Mountains of Miami, Propane, My Baby Wants to Be a Bell Ringer... Stunning voice, smart lyrics, great musicianship... most definitely worth leaving the house for on a rainy Saturday night..."